Welcome back! I hope everyone had a great break, and if you weren't taking classes I hope you were able to relax. Hopefully you are getting back into the swing of things as the spring semester gets started. The Office of Off-Campus Living and Commuting Student Se rvices has a lot of great events planned for this semester and I hope to see many of you that commute or live off-campus at them! Tomorrow we will be hosting a "Commuter Meet and Greet" in room 221 in the Mack Student Center. This is a chance for you to come meet and get to know other commuting students. As a reminder, the Office of Off-Campus Living and Commuting Student Services is involved with a program called "Snow Angels." This program provides students from Hofstra an opportunity to help senior citizens that live in the area by shoveling snow. If you are interested in helping out please stop by the office. It's hard to believe we're halfway through January already, and classes start in just about a week. To get back in polling mode for the new year, let's start easy- tell us who you are. And if you have ideas for polls you'd like to see this spring, leave a comment below or drop me a line at jayne.brownell@hofstra.edu. 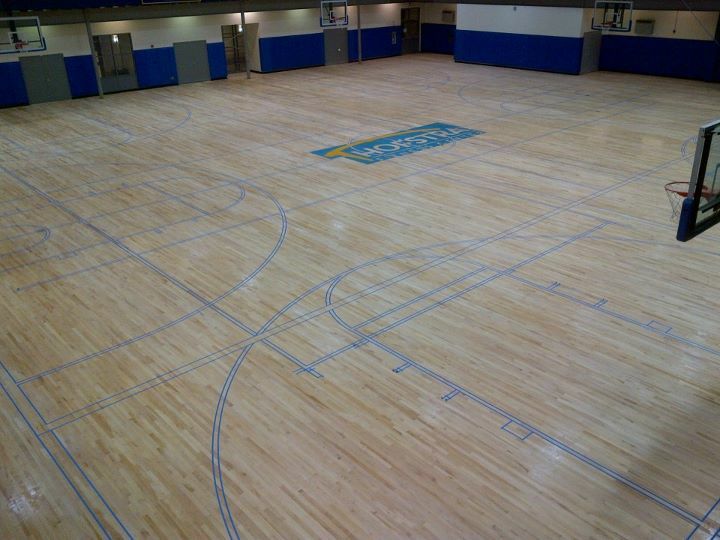 While many of you have been spending your Holiday Break catching up with family and friends, there has been quite the renovation going on at the Hofstra Fitness Center. On January 3rd, crews began the process of sanding down the old gym floor to bring the Hofstra community a professionally designed court that will be admired by students for years to come. While the sanding process made for a few dusty days around the facility, progress was quickly made, as workers sealed and then lined the new floor. Once the lining was done, the tedious job of painting the multitude of lines on the floor commenced. Watching the attention to detail that these workers had was truly something to see. 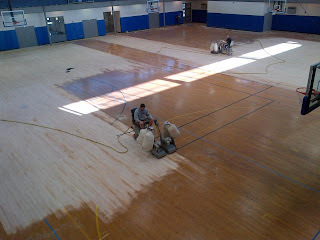 As I sit here writing this blog, the final coat of finish is continuing to dry on the new and improved floor. The renewed energy of the entire facility is palpable, as the new floor has brought a brighter, fresher feel to the building. The newly painted boundary lines are very distinct, which will provide players with a better playing experience. 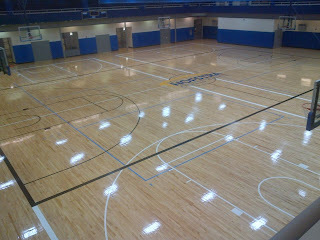 All in all, the new floor cements the Hofstra Fitness Center's status as a first-class facility. 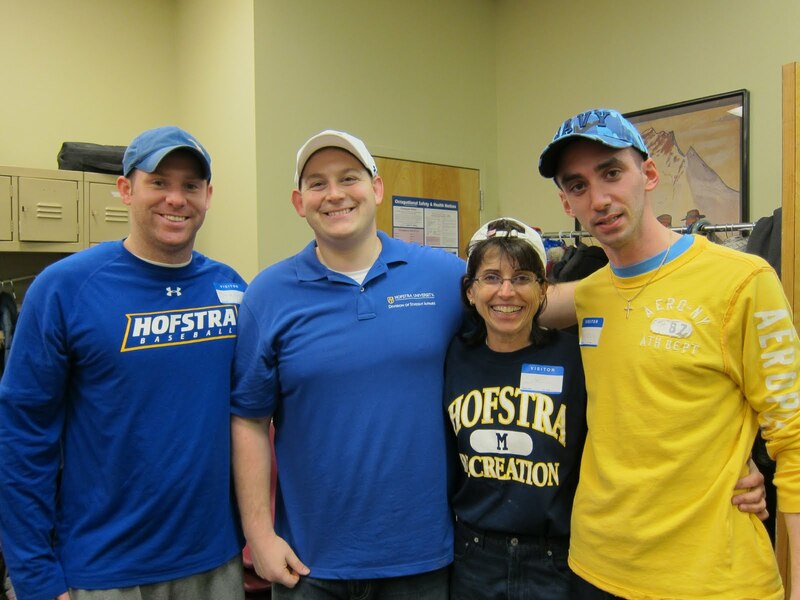 A big thanks goes out to Hofstra Vice President of Student Affairs Sandy Johnson, Dean of Students Pete Libman, and Senior Associate Athetic Director for Facilities Jay Artinian. Without their help and dedication, this project would never have happened. So as you return from what I hope was a relaxing and rejuvenating winter break, make sure you stop by the Fitness Center and check out the new floor. I promise you you won't be disappointed! What an eventful weekend the Nationally ranked Cheer and Dance team had—uh yes, I said Nationally ranked! 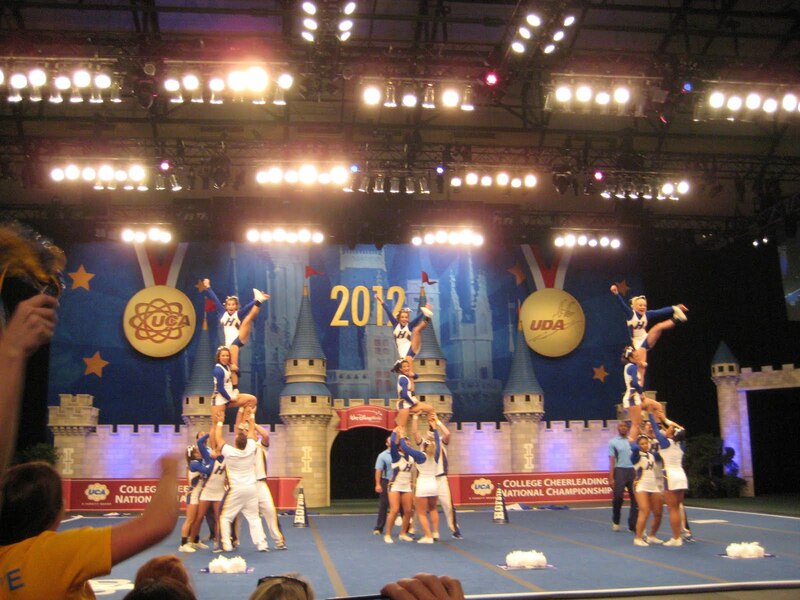 This past weekend Hofstra Cheer and Dance, along with some very dedicated families, friends, and alumni, traveled down to Walt Disney World, to compete in their respective annual Nationals competitions. 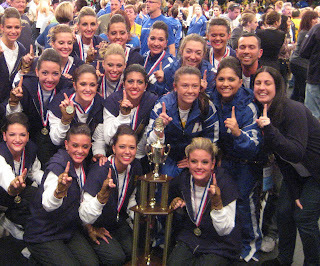 Since 2009, the Hofstra Cheer Team has been defending their number one, small coed, division 1 title and over the past TEN years, has won SEVEN national titles…no pressure! If videotaping was permitted, I would have highlighted for you just how loud over 50 family members and alumni can be, as we helped to project the HO-FS-TRA cheer in a facility similar in size to our Arena. Talk about school spirit—it’s truly a remarkable experience. 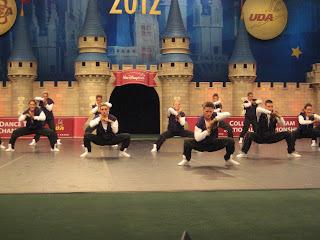 The Dance Team competes annually against other division 1 teams in both jazz and hip hop. This was their first year receiving a full-bid to compete at Nationals. That basically means that the tape they submitted to the Universal Dance Association (UDA) was so amazing, they paid for the team to travel to Florida to compete! I knew from the minute this team opened our Class of 2015 Celebration during Welcome Week, that this year would be there year! Sure enough, the team came in 2nd in the nation in their jazz routine, and 1st in hip-hop, defeating their long time rival and defender of the title, the University of Delaware! In addition, both teams competed at the first UCA/UDA World competition and also placed first! So the next time you attend a basketball game, you can take some serious PRIDE in knowing that two of your spirit teams are both NATIONALLY and INTERNATIONALLY number ONE! Congratulations to Hofstra Cheer and HUDT for an outstanding job representing our university this weekend. I am so proud of them! "All labor that uplifts humanity has dignity and importance and should be undertaken with painstaking excellence." MLK Jr.
Today the Division of Student Affairs staff had the opportunity to volunteer at the Mary Brennan INN. Fourteen staff members from across campus came together to volunteer and spend some time getting to know our colleagues better. We arrived at the INN at 9am and they put us right to w ork doing a variety of tasks from organizing the pantry, stocking food donations, organizing and hanging clothing and toiletry items and sorting items for the boutique. We took a break at 11am to meet again with all volunteers and discuss lunch service. Many of the staff were able to serve food, deliver food to the tables for families with small children and those unable to get food for themselves in the buffet line. While lunch was going on all the winter clothing items that had bee n sorted were brought out to the lunch room for the consumers to take if they wanted. 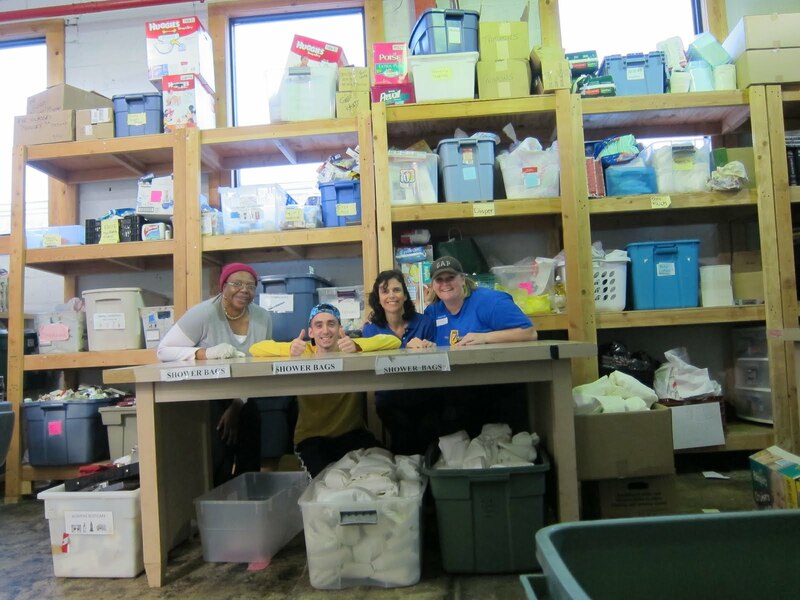 After lunch we cleaned and continued sorting clothing and toiletry donations. One team spent the last 45 minutes packing almost 300 shower kits for the consumers! Everyone who participated had a great time and wanted to come back for more. 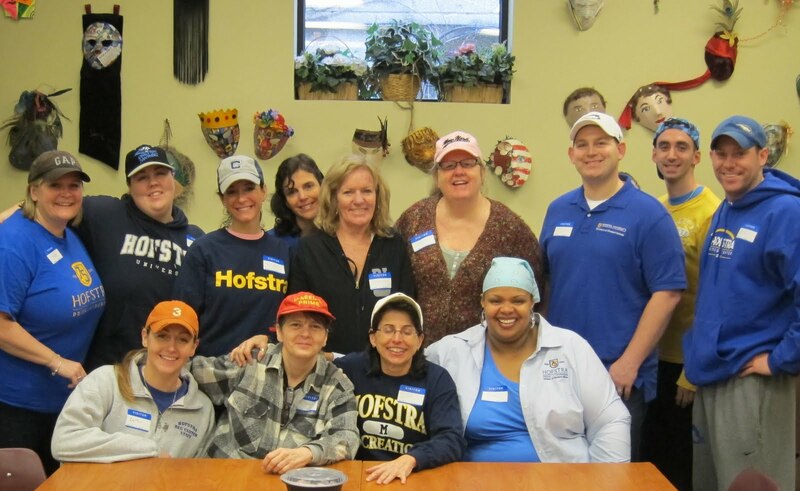 We hope you have the opportunity throughout your time at Hofstra to give back to the community and if it is at the Mary Brennan INN we know your experience will be great. Throughout this holiday weekend please take the time to reflect on Martin Luther King Jr. and the community service spirit that he embodied. Enjoy the rest of the winter break and see you on the 26th for the first day of classes! "Every man must decide if he will walk in the light of creative altruism or in the darkness of destructive selfishness." MLK Jr. 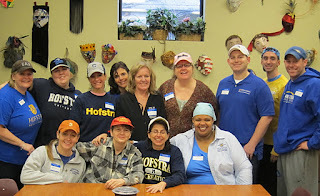 The Mary Brennan INN is always looking for volunteers and donations. Please contact the Office of Student Leadership and Activities for more information on student community service opportunities (516-463-6914 or hofstra.edu/osla). To contact the Mary Brennan INN directly call (516-486-8506).